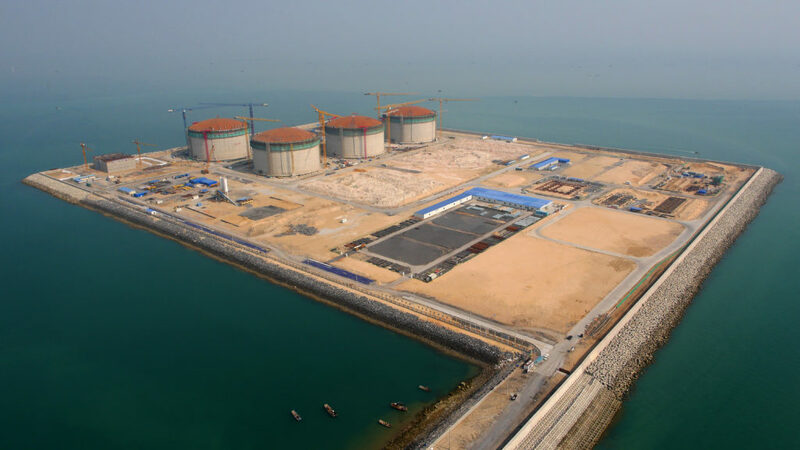 The Guangxi LNG project includes a 500 m Jetty and its associated Berth platform on which are installed 5 unloading 16’’ arms LNG, 4 LNG tank of 160,000 m3, re-gasification unit (with 4 ORV), a send-out unit (composed of 4 HP pumps), a fiscal metering system and a LNG truck loading facilities (10 bays). In Phase 2, the capacity of the terminal will be expanded to 7 MTPA. The construction of Phase 2 elements is predicted to start just after completion of Phase 1. An ultimate Phase is also predicted. The capacity of the Terminal will be 11 MTPA. The Front End Engineering Design (FEED) performed gives technical basis to allow Chinese technical institute to develop the detail engineering and to start the construction. SOFREGAZ has performed with its own resources all process and utility design of this project and has subcontracted to Technodyne the design of the LNG tanks. After FEED completion, SOFREGAZ is involved in the supervision of detail engineering performed by the Chinese institute of SINOPEC (LPEC), to guaranty the performance value established during the FEED for the LNG terminal.